Langerhans cell histiocytosis (LCH) describes a group of syndromes that share the common pathologic feature of infiltration of involved tissues by Langerhans cells. Typically, the skeletal system is involved, with a characteristic lytic bone lesion form that occurs in young children or a more acute disseminated form that occurs in infants. Pulmonary involvement is not unusual in systemic forms of LCH, but symptoms are rarely a prominent feature. 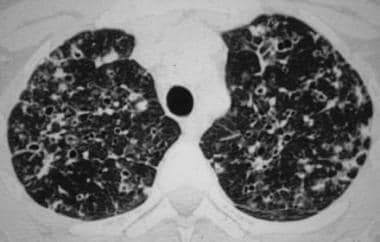 [1, 2] Pulmonary Langerhans cell histiocytosis is considered a reactive proliferation of dendritic Langerhans cells to chronic tobacco-derived plant proteins resulting from incomplete combustion, but it can also occur as a tumor-like systemic disease in children. CT scans of eosinophilic granuloma are depicted in the images below. Chest CT in a patient with pulmonary eosinophilic granuloma demonstrates scattered cavitary and noncavitary nodules. High-resolution chest CT scan in a patient with pulmonary eosinophilic granuloma shows the typical combination of nodules, cavitated nodules, and thick- and thin-walled cysts. Image courtesy of European Respiratory Society Journals LTD.
High-resolution chest CT scan in a patient with advanced pulmonary eosinophilic granuloma shows numerous pulmonary cysts of various sizes, which are confluent in some places. Image courtesy of European Respiratory Society Journals LTD. Localized pulmonary LCH (also termed pulmonary eosinophilic granuloma) is a rare pulmonary disease that occurs predominantly in young adults. The precise incidence and prevalence of pulmonary LCH are unknown, although studies of lung biopsy specimens from patients with interstitial lung disease identified pulmonary LCH in only 5%. 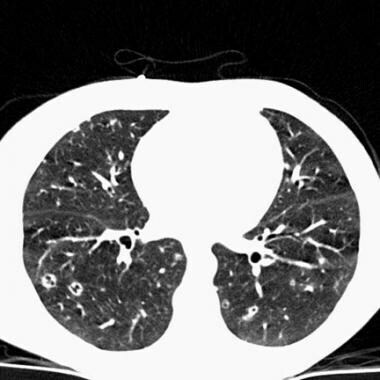 A confident diagnosis of pulmonary LCH often can be made based on the patient's age, smoking history, and characteristic high-resolution computed tomography (HRCT) scan findings, especially if patients are followed without treatment. Definitive diagnosis, if necessary, can be made by identification of Langerhans cell granulomas in lung biopsy samples acquired by video-assisted thoracoscopy. Biopsy sites are selected on the basis of HRCT scan findings. Transbronchial biopsy has a low diagnostic yield (10-40%) because of the patchy nature of the disease and the small amounts of tissue obtained. Treatment consists of smoking cessation, which stabilizes symptoms in most patients. Corticosteroids are used in progressive or systemic disease. Cytotoxic agents (eg, cyclophosphamide) can be employed for patients who do not respond to smoking cessation and steroids. No treatment has been confirmed to be useful, and no double-blind therapeutic trials have been reported. Lung transplantation also has been performed for treatment of LCH. Lung volumes are generally preserved, or even increased, in contrast to most other pulmonary infiltrative diseases. Associated pneumothorax is found in 15-25% of patients, and pleural effusion is rare. In the late stage, diffuse cysts may be found that spare only the costophrenic angles. Gallium-67 scans usually are negative. Bano S, Chaudhary V, Narula MK, Anand R, Venkatesan B, Mandal S, et al. Pulmonary Langerhans cell histiocytosis in children: a spectrum of radiologic findings. Eur J Radiol. 2014 Jan. 83 (1):47-56. [Medline]. Kim HJ, Lee KS, Johkoh T, Tomiyama N, Lee HY, Han J, et al. Pulmonary Langerhans cell histiocytosis in adults: high-resolution CT-pathology comparisons and evolutional changes at CT. Eur Radiol. 2011 Jul. 21 (7):1406-15. [Medline]. Popper HH. [Pulmonary Langerhans cell histiocytosis]. Pathologe. 2015 Sep. 36 (5):451-7. [Medline]. Tazi A. Adult pulmonary Langerhans' cell histiocytosis. Eur Respir J. 2006 Jun. 27(6):1272-85. [Medline]. [Full Text]. Vrielynck S, Mamou-Mani T, Emond S, Scheinmann P, Brunelle F, de Blic J. Diagnostic value of high-resolution CT in the evaluation of chronic infiltrative lung disease in children. AJR Am J Roentgenol. 2008 Sep. 191(3):914-20. [Medline]. Martin I, Ballester M, Ruiz Y, Llatjós R, Alarza F, Molina M. Presentation of pulmonary Langerhans cell histiocytosis before the development of lung cysts. Respirol Case Rep. 2013 Dec. 1 (2):34-5. [Medline]. Tazi A, Marc K, Dominique S, de Bazelaire C, Crestani B, Chinet T, et al. Serial computed tomography and lung function testing in pulmonary Langerhans' cell histiocytosis. Eur Respir J. 2012 Oct. 40 (4):905-12. [Medline]. Abbritti M, Mazzei MA, Bargagli E, Refini RM, Penza F, Perari MG, et al. Utility of spiral CAT scan in the follow-up of patients with pulmonary Langerhans cell histiocytosis. Eur J Radiol. 2012 Aug. 81 (8):1907-12. [Medline]. Lee HJ, Ahn BC, Lee SW, Lee J. The usefulness of F-18 fluorodeoxyglucose positron emission tomography/computed tomography in patients with Langerhans cell histiocytosis. Ann Nucl Med. 2012 Nov. 26(9):730-7. [Medline]. Hansen NJ, Hankins JH. Pulmonary langerhans cell histiocytosis: PET/CT for initial workup and treatment response evaluation. Clin Nucl Med. 2015 Feb. 40 (2):153-5. [Medline]. Sundar KM, Gosselin MV, Chung HL, Cahill BC. Pulmonary Langerhans cell histiocytosis: emerging concepts in pathobiology, radiology, and clinical evolution of disease. Chest. 2003 May. 123(5):1673-83. [Medline]. [Full Text]. Canuet M, Kessler R, Jeung MY, Métivier AC, Chaouat A, Weitzenblum E. Correlation between high-resolution computed tomography findings and lung function in pulmonary Langerhans cell histiocytosis. Respiration. 2007. 74(6):640-6. [Medline]. Brauner MW, Grenier P, Tijani K. Pulmonary Langerhans cell histiocytosis: evolution of lesions on CT scans. Radiology. 1997 Aug. 204(2):497-502. [Medline]. Colby TV, Swensen SJ. Anatomic distribution and histopathologic patterns in diffuse lung disease: correlation with HRCT [published erratum appears in J Thorac Imaging 1996 Spring;11(2):163]. J Thorac Imaging. 1996 Winter. 11(1):1-26. [Medline]. Bonelli FS, Hartman TE, Swensen SJ. Accuracy of high-resolution CT in diagnosing lung diseases. AJR Am J Roentgenol. 1998 Jun. 170(6):1507-12. [Medline]. Hartman TE, Tazelaar HD, Swensen SJ. 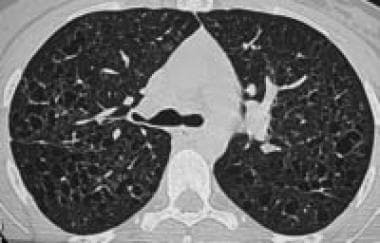 Cigarette smoking: CT and pathologic findings of associated pulmonary diseases. Radiographics. 1997 Mar-Apr. 17(2):377-90. [Medline].